The completely renovated Riu Palace Tropical Bay showcases 452 guestrooms,dining options, wellness facilities, swimming pools, a complete makeover of the entire property and much more. This elegant, Victorian-style hotel is situated above the famous beach of Bloody Bay, bathed by the warm waters of the Caribbean Sea. Children can enjoy their own pool and playground. Free weddings are available and golf is nearby. Guests receive exchange privileges at Riu Negril. 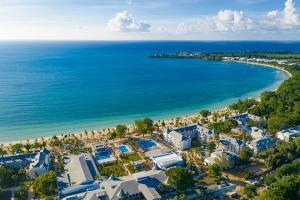 Located on Bloody Bay Beach in Negril, 48 miles from Montego Bay International Airport. Negril - Main restaurant; Krystal - Fusion restaurant; Rimini - Italian restaurant; Poolside Restaurant/Grill and Steakhouse; Hakuchi - Japanese restaurant. Dunn's River Falls, Montego Bay Hi-Lite & Rose Hall Greathouse Tour, Rick's Cafe Sunset, Horseback Riding, Deep Sea Fishing, Jolly Mermaid Cruise, Sunsplash Cruise party, Negril Hi-Lite Tour, Mountain Valley Rafting.